MOVIE PROP BOOKS - TREMORS 3 - BACK TO PERFECTION. 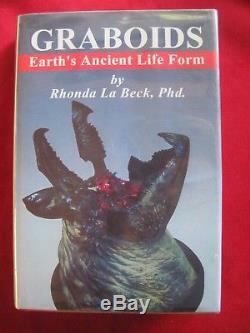 Original Movie Prop Book of Graboids. Earths Ancient Life Form by Rhonda La Beck, PhD. Used In the Making of the Film, Tremors 3 - Back to Perfection. Los Angeles: Universal Pictures, 2001. 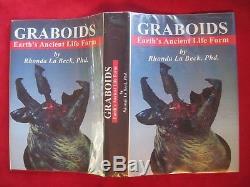 The original hardbound movie prop book, Graboids. Used in the making of the film Tremors 3 - Back to Perfection, directed by Brent Maddock, screenplay by John Whelpley from a story by Brent Maddock, S. Wilson, and Nancy Roberts, starring Michael Gross, Shawn Christian, Susan Chuang, and Ariana Richards. 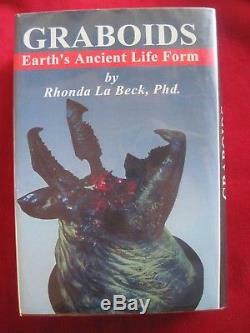 This prop book was used prominently in a scene in which the films star, Michael Gross, gathers his friends together in a Chinese market in their desert hometown of Perfection, Nevada, and says that there has been published research done on the subterranean morphing, man-eating creatures known as Graboids by a woman named Rhonda La Beck. The owner of the market (played by actress Susan Chuang) immediately reports, I sell all her books. The market caters to tourists who are hoping to spot a Graboid, and is stocked with all manner of Graboid souvenirs and trinkets and copies of this prop book, which can be seen face-out on the shelves. The front panel of the books faux dust jacket shows an image of an aptly named Graboid at its most menacing - worm-like and scarily openmouthed. This book dust jacket is wrapped around a copy of the book Carmelo by Sandra Cisneros. 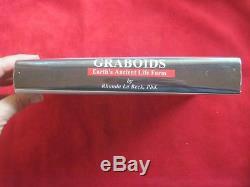 The item "GRABOIDS MOVIE PROP BOOK FROM TREMORS 3 BACK TO PERFECTION 2001" is in sale since Sunday, October 8, 2017. This item is in the category "Entertainment Memorabilia\Movie Memorabilia\Props\Originals". The seller is "catstarbuck" and is located in Santa Barbara, California. This item can be shipped to North, South, or Latin America, all countries in Europe, Australia, Japan, China, South Korea, Indonesia, Taiwan, South africa, Thailand, Hong Kong, Israel, New Zealand, Singapore, Saudi arabia, United arab emirates, Qatar, Kuwait, Bahrain, Malaysia, Bangladesh, Brunei darussalam, Egypt, Jordan, Cambodia, Sri lanka, Macao, Maldives, Oman, Pakistan, Reunion.